Glenn T. Seaborg was one of the most remarkable and influential chemists of the 20th Century. Born in 1912 in Michigan, he came to Los Angeles at the age of ten. After completing undergraduate studies in Chemistry at UICLA in 1934, he began graduate work in nuclear chemistry at Berkeley and received a Ph.D. in 1937. He joined the faculty at Berkeley as instructor in 1939. Dr. Seaborg's lifelong research effort was directed toward the radiochemical synthesis and characterization of elements. He and his coworkers discovered ten transuranium elements and many isotopes that have applications in research, medicine, and industry. In 1951, he was awarded the Nobel Prize in Chemistry. After serving as Director of the Lawrence Berkeley Laboratory from 1946-58, he accepted the position of Chancellor at UC Berkeley. In 1961, he was named Chairman of the U.S. Atomic Energy Commission, a position he held for ten years. Dr. Seaborg played a key role in the conclusion of the treaty that banned the testing of nuclear weapons in the atmosphere. 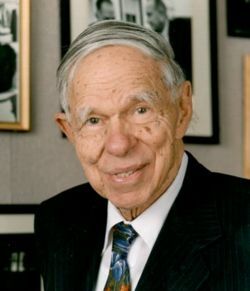 Dr. Seaborg was the recipient of many awards, including the National Medal of Science and the Enrico Fermi Award, and held the unique distinction of having element 106, Seborgium, named after him. He remained active in research, education, and public service until his death in February, 1999.